Your computer comes with a lot of programs, some are vital like a word processor or spread sheet make, but often will come with extraneous programs that you may not use, such as an extra video editing software or a virus protection program you may not use. These files on your Windows computer may be taking up space and slowing down your operations. It is important to not clutter your hard drive for it will slow things down and you may have to defragment it more often. Before we walk you through the steps of deleting unneeded programs on your Windows computer, we would suggest you consult your local IT professional or computer advisor to make sure you are not accidentally deleting any important programs. 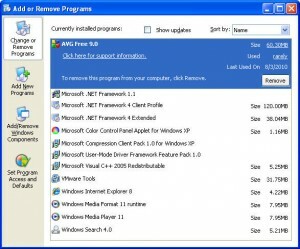 While a lot of programs you install or download have their own built in removal methods, we believe going through the “Programs” folder in the “Control Panel” folder is the most effective way to delete all the extra files that can be left behind after a program is supposed to be gone. Some uninstall functions will leave temporary data or saved data that is of no use to you any longer.